UPDATE 01/21/19: We've wrapped up the major winter 2019 collector car auctions in Scottsdale/Phoenix, AZ area with solid results that continue to surprise in light of financial stressors both in the U.S. and abroad. There is a continued trend of climbing prices for "resto-mod" and "tribute" cars, which may be disturbing for purists and historians but I believe to be good for the industry and the market. This phenomenon is understandable. Well executed cars of this genre look as good or better than an “authentic” example, with typically improved performance, reliability and comfort. What’s not to like? Will such cars maintain their value – No, at least not in comparison with quality blue-chip original or accurately restored cars, but better than a brand new 2019 anything. Please note that I assign value based on the desirability of core vehicle, the quality of the components plus engineering and workmanship. If a resto-mod car comes out of a respected professional shop it will typically have all of those attributes checked off, not always so with private builders and hobbyists who may not have the budget to play with and cut corners here and there – so pedigree does matter. 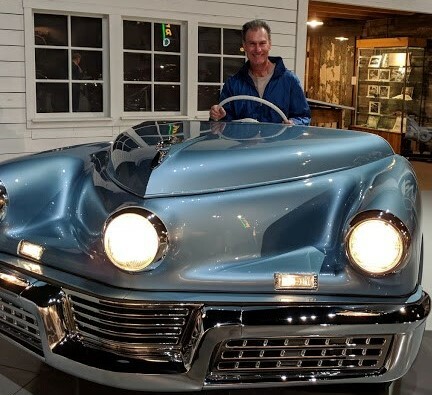 ﻿Photo above is me behind the wheel of the 1948 Tucker mockup at the AACA Museum in Herhey, PA. The display demonstrated how the center headlight turns with the steering wheel. Brilliant! We look forward to the opportunity to serve your automotive appraisal, consulting and research needs.